Looks like some familiar stuff here, but thought you guys might like it anyway. I am guessing that they may be a member here. Nice find, Andy - thanks for sharing! Very nice collection...thanks Andy; good find. wow! 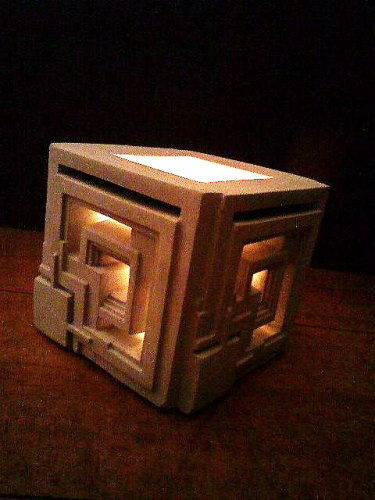 where can I get one of these cubes!? They used to be on Ebay all the time. Just be aware they are only 5" high and usually over $50 each. The bad thing about these lamps are the weight. Shipping cost could be higher than price! I have one. It's a nice item! Compare size with the rest of stuff. Same issue with Brion life mask... (that's why I still haven't it). Andy, this blog seems my collection in Japanese! With all my respect of course! Wow.... I turn every page and when items appears I must shout "I have it! ", hehe! (or, in some cases, "I must have it!!!"). Some are not screen accurate, like Marguerite glass, or HL-1 desktop fan. Same faults as I did in the past! Nice... I will "read" entire blog. It's a nice reference!! And... "Promenades en France" and "Magnifications" book are in the way... thanks to ebay.com.my and abebooks! I would love to have one (or more) of these myself, but the cost does not justify. It's a lamp... thus, it works with candles!